Dr. Swarn Lata, doctorate in Sitar instrumental music and celebrated Sitarist for 30 years, runs this sitar school at the intersection of Keele Street and Dundas, Toronto. Students of all age groups and cultural backgrounds passionately pursue their love for the stringed instrument - sitar, at the 'Sitar Darpan School of Music'.Dr. 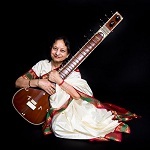 Swarn Lata is the only female sitar teacher in Ontario. Sitar classes are in full swing. Book one for yourself TODAY. It was invented by Amir Khusrau, a legend in Indian classical music. In the beginning there were only three strings in sitar 'Se' means three and 'taar' means string, hence the name.